Have you ever experienced moments living in complete darkness and tasted the life of a visually impaired person? Now you have the chance! 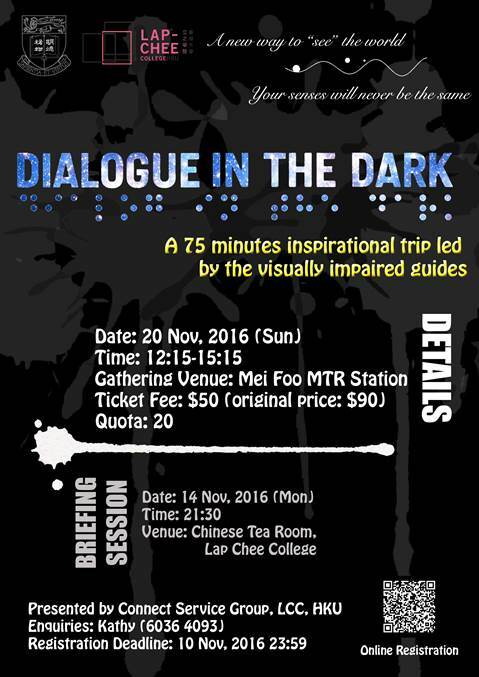 The Connect Service Group, Lap-Chee College, is organizing an adventurous tour to the Dialogue in the Dark Experiential Exhibition in Mei Foo. In this 75-minutes tour, you will be led by professionally trained visually-impaired guides to experience the world in a unique and inspirational way. The strength of your senses will be revealed and you will learn to see things in a whole new way! It would definitely bring you new perspective of social inclusion, diversity and equality! If you have any enquiries, please contact Kathy (6036 4093)!